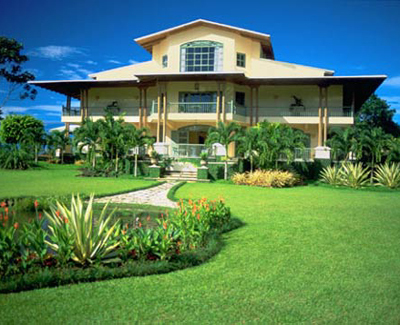 Set in a tropical paradise, this "plantation home" is surrounded by scenic mountains, towering volcanoes . . .
Set in a tropical paradise, this "plantation home" is surrounded by scenic mountains, towering volcanoes, coffee, sugar cane and macadamia plantations, and the rushing Reventazon River, world-famous for its whitewater rafting. Offering 12 spacious rooms and 4 suites with private baths and balconies, the luxurious inn is an ideal base for local excursions and activities, including sports adventures and plantation tours. Resort features include a gourmet family-style restaurant, cozy bar, garden patio, spring-fed swimming pool, private airstrip, and tropical gardens abounding with exotic plants, flowers, and birds.